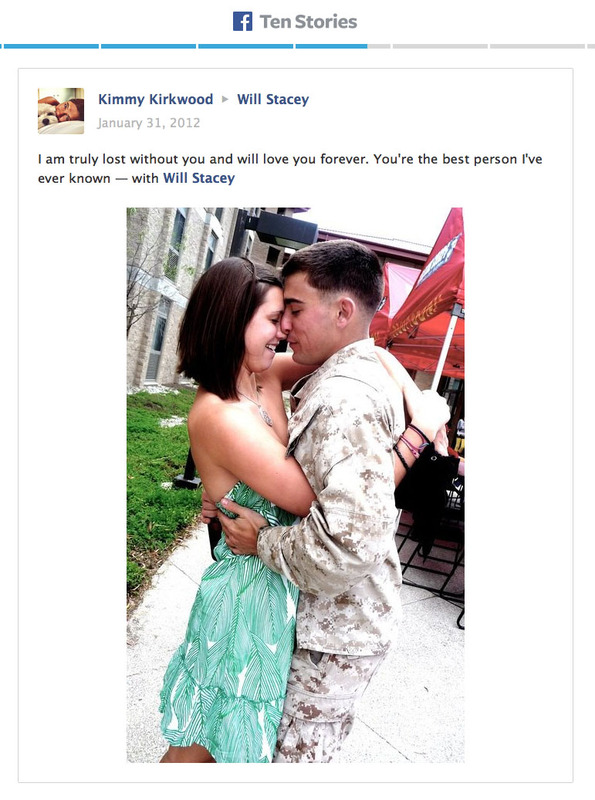 The love story between Kimmy Kirkwood and her fallen Marine boyfriend, Sgt. 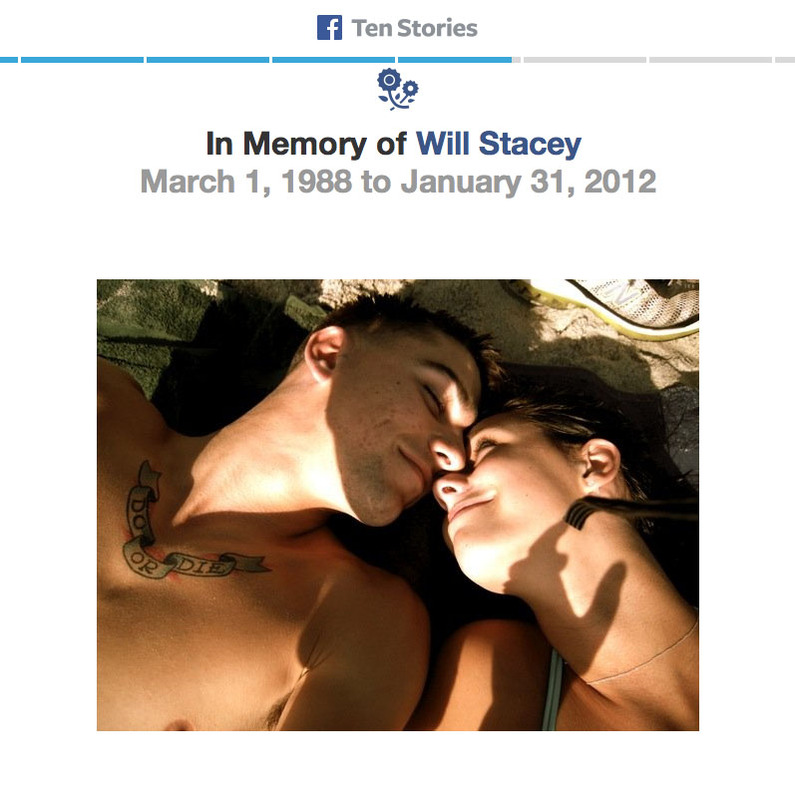 Will Stacey, will forever be preserved in a Facebook tribute of the two showing how their lives became intertwined on social media in honor of website’s 10th birthday. While most users saw their timelines filled with “a look back” videos over the past few days, 10 people were selected for a bigger project Facebook launched to highlight how people come together through social media. It’s called called “Ten Stories,” and was launched on Tuesday. Kirkwood and Stacey’s Facebook story starts when the young couple reconnected a few years after high school in 2006. They started dating in 2007. Stacey, who was assigned to 2nd Battalion, 4th Marines, deployed to Afghanistan for the first time in 2008, while Kirkwood studied abroad in Italy. They exchanged letters since communication was difficult. In September 2011, after reenlisting and being meritoriously promoted to sergeant, Stacey deployed to Afghanistan for the third time. He left weeks after the couple celebrated their third anniversary. 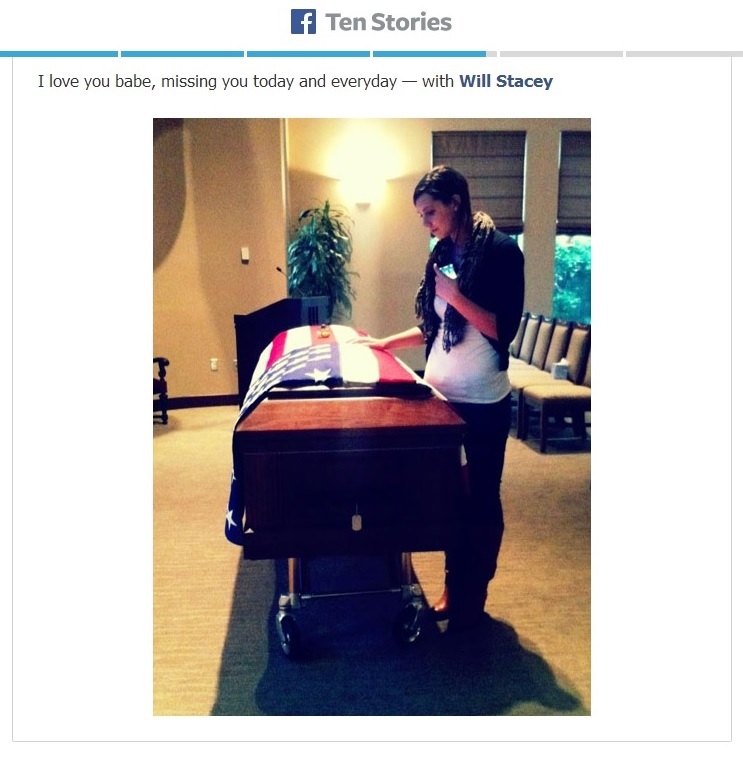 Their Facebook story closes on January 31, 2012, when Stacey was killed by an IED while on patrol in Afghanistan. Kirkwood wrote about the decision to share their story on her Facebook page on Tuesday. “When Facebook approached me about participating in this, I was happy to help,” she wrote. “I realized awhile ago that without Facebook, so much of my life with Will would never have been documented, and probably would be eventually forgotten over time. Then she realized that much of what she missed about him, their conversations, his humor, was all documented on Facebook, she wrote. You can view the couple’s full story here. I married my steady as a Lance Corporal. One of my fondest memories was when she came to my graduation. My daughter was born while I was active duty and shares the Marine Corps legacy with me. God bless you Stacey and thank you for sharing your story.